Set in medieval Russia, The Bear and the Nightingale follows Vasalisa (Vasya) Petrovna, the young daughter of a country noble. Vasya was born with a destiny; her mother sacrificed her own life so that she could inherit her family’s magical heritage. She can see and communicate with the household and woodland spirits around her. However, when her father marries a new devoutly Christian woman, her arrival puts an end to the traditional offerings to the spirits and their protection weakens just as an ancient evil is breaking free of his bonds. The Bear and the Nightingale is quiet and slow, focusing on Vasya’s domestic life for the first two-thirds, but it’s never boring. It completely immerses you the atmosphere of the place and time that it’s set in in a way that few other books do. There’s the obvious comparison to Hild by Nicola Griffth, another story that takes real-life historical figures who are dealing with the advent of Christianity pushing out indigenous religious beliefs and tells their story with an incredible amount of detail about their day-to-day life. But the book reminded me most of the movie Whale Rider in tone, the protagonists of both are young women who know who they are and the world around them must eventually give up trying to contain them and instead bow to their convictions. Vasya is a remarkable protagonist, she acts and thinks like a woman of her time but she’s still almost a force of nature. The other characters in the book are just as rich as Vasya, even the antagonists. You can’t bring yourself to despise Vasya’s hysterical stepmother Anna or the overzealous village priest Father Konstantin despite the awful things they do because their actions are so obviously motivated by their fear and unhappiness with parts of their life that they could not control. Vasya’s family loves her, but they are people of their time and their adherence to tradition stifles Vasya just as effectively as the more antagonistic characters. But they are still characters you grow to love. I’ve always been captivated by Russian folklore with its guardian spirits that are an inseparable part of daily life. This book perfectly captures the feeling of living in a such a world and it’s hard to tell where the real world begins and what’s magical because it’s all reality to Vasya. It mixes medieval slice-of-life with fairy tale conventions effortlessly. Morozko the winter-king says to Vasya at some point that magic is just choosing to believe that the world is the way you want it to be and I think that conveys the tone of this book rather well. The worldbuilding is only enhanced by the author’s beautiful prose that conjures up vivid imagery from very few words. 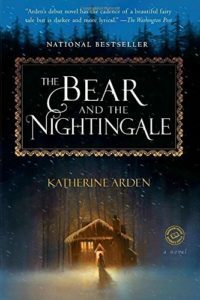 The Bear and the Nightingale was one of my favorite books of the year. I particularly appreciated that this book tells a satisfying story by itself. If I didn’t already know there was a sequel, I would have assumed it was a standalone. But I’m so glad that there is a sequel and I have an early copy of it because I can’t wait to spend more time in this world. This entry was posted in Books, Reviews and tagged book 1, fantasy, fiction by Kriti Godey. Bookmark the permalink.